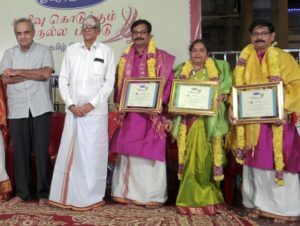 The Mylapore Trio, S. Amarnath, S. Surendranath and S. Aparna were honoured with the ‘Nallor Virudu’ award at an event organised by Sri Krishna Sweets and Youth Association for Cultural Development at Sri Kapaleeswarar Temple, Mylapore on Dec 2. The function was presided over by M. Murali, the founder of Sri Krishna Sweets. The chief guest was N. V. Balasubrahmaniam, an octogenarian and former judge of Madras High Court. All the three awardees have made substantial contributions to the fields of charity, education and culture in the Mylapore area. The award carried a citation and a shawl. This entry was posted on Wednesday, December 19th, 2018 and is filed under People. You can follow any responses to this entry through the RSS 2.0 feed. You can skip to the end and leave a response. Pinging is currently not allowed.